A personalized gift makes a lovely present for a newborn baby. 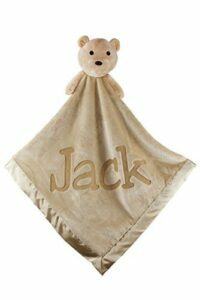 An item with your baby’s name on it makes a great keepsake once they are finished with it – it will be treasured forever. There are so many different items which can be personalized, it can be difficult to know what to choose. Here, we have picked out a few different kinds of baby gifts to help you make the best choice. There are loads of different personalized gifts available for babies. Think about what kind of item you would like to buy, for example, a blanket, a toy or something to wear. This will help you narrow your search down a bit and make finding the perfect present easier. You should also think carefully about how you want to personalize your gift. Some messages can only be a certain number of characters, so you might only be able to put your child’s name on it. 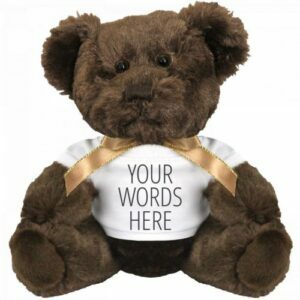 Others can be customized to give a message of your choice, giving you more flexibility as to what you want to say. This is a great gift for children of any age. They will love to see the train sitting on a shelf just as much as they will love playing with it. They can run along traditional wooden train tracks, giving your child a fun toy as well as a nice keepsake. There is a lot of flexibility with this item – you can choose how many letters you need depending on how long the name is. It’s also possible to buy extra carriages separately, in a variety of colors. The NameTrain is a unique, interesting gift which will be well received by parents as well as children of all ages. 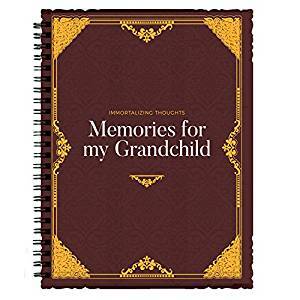 This memory book is a great gift for grandparents to their grandchildren. You can keep the book and add to it as you make new memories with your grandchild, then give it to them to read through and remember when they are older. The book is great because it can be customized and personalized as you choose, meaning you can completely tailor it to your tastes. Whilst young babies won’t benefit from this book straight away, it is a lovely thing to start when they are young to record your special times together as they are growing up. You could keep it a secret and present it to them on their 16th or 18th birthday for an extra-special gift. Or you could fill it in together with your grandchild to enjoy some quality time together. This is a cute set perfect for a baby boy or girl. It can be personalized with a name or initials of your choice, in a variety of fonts and colors. The cozy slippers are great for keeping little feet cozy when you are out for a walk in the stroller before proper shoes are needed. The monogrammed robe is made from 100% cotton, making it perfect for young babies’ delicate skin. 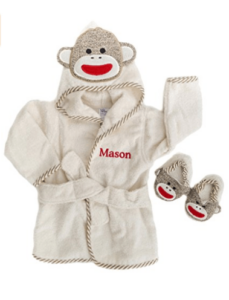 It is great for keeping your baby nice and warm after a bath – everyone will say how cute they look, too! It can fit babies from newborn up to 9 months, which makes it great value for money. This personalized storybook makes a great gift for a new baby – it will be treasured forever by parents and children as they grow up. 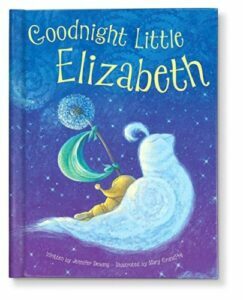 It is a great way to get babies used to their own name, and they will love to look at the beautiful illustrations as they listen to the soothing bedtime story. The book can be customized with details such as the child’s name and birth date and can also include a message from the sender. The book makes a great gift for both boys and girls and is great to give at a baby shower if the baby’s name has already been revealed. Children will love to read this story even as they grow a bit older, giving great value for money. Even when they no longer read it, the book can be kept as a keepsake in a memory box. It is hardback and made from great quality materials, meaning it can stand up to a few years of use and remain in good condition. This lovely soft blanket is perfect for keeping a newborn baby warm in bed or in their stroller. It comes in three colors – pink, blue or brown, meaning there’s something for every taste. You can have it with any name you choose and also the birthdate if you wish. There are various fonts to choose from too, so you can really make the blanket personal. The blanket is large enough to keep a young baby well wrapped up and warm and is also ideal for toddlers to use when sitting at home or on the go. The friendly teddy bear head is sure to be a hit with babies and toddlers alike, and will soon become their favorite comforter. The facial features of the bear are embroidered, making it safe for newborn babies, without the risk of choking. This personalized baby blanket makes a great baby shower gift for expectant parents. It can be completely tailored to suit the individual – it comes in different colors and you can add the name, birthdate and birth weight and length to make it really unique. It can come with a footprint and heart design, or not if you wish. The customized baby gift measures 36 by 36 inches, making it perfect for keeping your new arrival warm inside and outside the house. The material is super soft and cozy for your baby – this will surely be their favorite blanket as they grow up. This lovely personalized book is a great, unique baby gift. 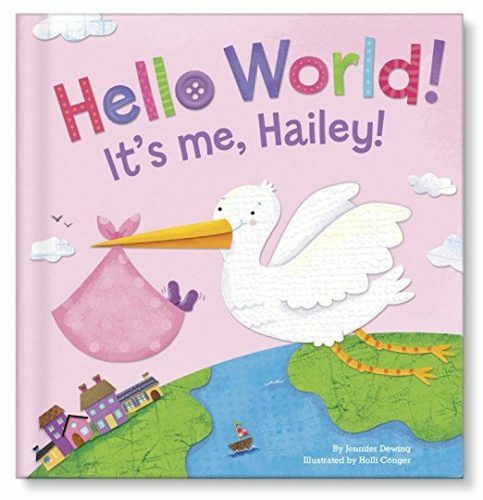 There is a pink or a blue version, so you can choose the color and the book can be customized with baby’s name, date and place of birth, and weight and length. The book is sure to become a favorite straight away – babies will love hearing their parents’ voices as they read the story aloud. Hearing their own name repeated throughout is great for keeping their interest even at a young age. The pages of the book are thick and strong, so it is safe in the hands of even very young babies. Parents will treasure this special book for years to come – it is a perfect gift for new parents as well as their baby. 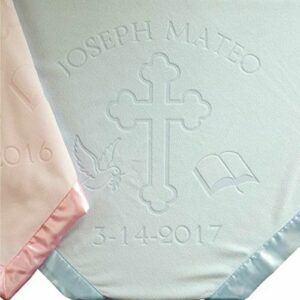 This customized baby blanket is a perfect christening gift for godparents to give to their new godchild. It can be changed to suit individual tastes, coming in either pink or blue. There is the option to add the birth date or date of the christening to make the blanket extra special. The soft fleece blanket has a satin trim – perfect for young babies to snuggle up and keep warm. The large 35 by 35-inch size is perfect for growing babies – they will be able to enjoy the blanket for a few years before storing it away safely to look back on later. The personalized baby blanket is a great keepsake gift, to forever remember the special day. Parents will be delighted with this unique gift for their newly baptized baby. This cute teddy would make a lovely gift for a new baby boy or girl. It can be fully personalized with any message of your choice. You could include the baby’s name, birth date, or a special message – it’s up to you. Whilst the bear isn’t ideal for very young babies to snuggle up with as it has non-safety eyes, it would look great decorating the nursery. As your child gets older, they will love going to sleep with their very own unique bear. It makes a lovely keepsake which can be treasured and cuddled for years to come. Because you have flexibility over the message, you could give it as a gift at any time – it could be great for a first Christmas or birthday, or given as a christening gift. This unique custom baby blanket makes a cool gift for parents who want something a bit different. It comes in a choice of 9 color options, so there is sure to be something to suit all tastes and styles. The plush material is perfect for ensuring your baby stays warm and comfortable when wrapped up in this gorgeous blanket. 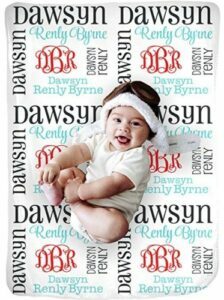 The monogrammed baby blanket measures 30 by 40 inches, which is a great size for growing babies. It can be folded when they are tiny, then used unfolded in their crib as they grow. The blanket is plain white on the back, which means it can be used to match almost any room and is perfect for both boys and girls. The blanket is a great baby shower gift – it is sure to receive lots of compliments thanks to its unique design. 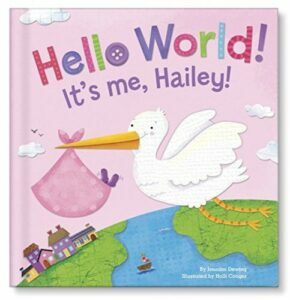 There are loads of great, unique gifts for newborn babies but our favorite pick is the Hello World customized book. The lovely story is sure to be adored by newborn babies, and parents will be delighted with such an unusual gift. There is a range of customization options for this book, meaning it can be used by anyone. This would make a lovely gift for new parents who already have all the basics they need for their new baby and are looking for something extra special. If you are looking for a lower-cost gift for a special newborn, the memory book is a great choice. There are different styles – there is one for parents and one for grandparents. This is a great way to record the milestones of a baby’s early years, and share precious memories with them as they grow older. Creating a memory book can be a fun activity to do together with the child, for example, you could paint their handprints in it. The child will be delighted to look back through the book when they are older and remember all their old memories.